The results of the 2018 midterm election in Orange County have been tallied, and now Orange County Board of Election officials can take stock and review the election results that matter most to them: local demographics, efficiency and turnout numbers. Orange County Elections director Rachel Raper presented a report card on the midterm election in Orange County to the Board of Commissioners earlier this month. Not to mention a water main break on November 5 that meant mobile restrooms had to be carted to more than 40 polling stations across the county for election officials. But despite all that, the November elections went smoothly in Orange County, Raper reported. Local election officials were able to complete all pre-election goals, which include auditing campaign finance reports and training staff for all precincts. And more good news: there were no problems reported with polling machines used in Orange County. Carrboro Town Hall was the busiest early voting polling location, servicing 11,000 residents during early voting. 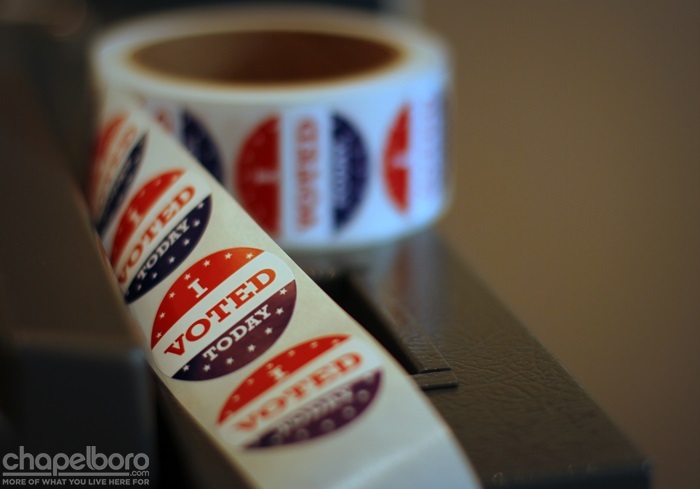 Overall, 1,776 new voter registrations were processed during that period. Raper said turnout was very good compared to similar “blue moon” elections. Occuring every twelve years, blue moon elections see ballots without any statewide campaigns, outside of judicial races. That means no large statewide efforts to mobilize voters. Raper reported that 58.7 percent of eligible voters participated in the election. That turnout compares favorably with the turnout from the last blue moon election in 2006, which saw 38.6 percent of Orange County voters come out to the polls. For comparison, the election in 2016, which saw state seats and a presidential race on the ballot, received 70 percent voter turn out.